It is the eve of Mary's wedding, a night filled with dreams: dreams of love, dreams of war and dreams of what might be. When Mary and Charlie, filled with passion, vulnerability and impulsiveness of youth, unexpectedly find one another sheltering in a barn during a thunderstorm, a tentative love is born. But the year is 1914, and Mary and Charlie must surrender their love and their fate to the uncertainties of their tumultuous times. Since graduating from the Dawson College professional theater program in the Spring of 2010, Allison Busner has been making the most of her acting experiences around the Montreal area. From the time when she was a child, Allison has been very passionate about ballet, dance and performing in front of an audience. At the age of 12, Allison first found herself acting on stage as Jane in a local production of Grease. She has since gone on to take classes at the Montreal School of Performing Arts and at Dawson. While at the Dome, Allison has had the opportunity to play Chris Gorman in Rumors, Berthe Martin in Yesterday the Children were Dancing, Portia in Her Infinite Variety, Evelyn in Beside Herself, and Mrs. Putnam in The Crucible. This is Dustin's fouth time with Persephone Productions. His other roles with Persephone include Michael in Unity (1918) and Venus in To The Green Fields Beyond - winner of the 2007 MECCA for Best Ensemble; And to the great excitement of his family he played a Welshman, Fluellen in Henry V last year. Some of his most memorable roles include the one man show Bang boy, Bang!, which was presented in the UK at the Birmingham Rep before touring theatres in England and Wales, Bert in The Man Who Came to Dinner(Townships Theatre), Earnest in The Importance of Being Earnest(Dogcart Productions), and Eli Jenkins inUnder Milk Wood (Vanguard Productions). A proud graduate of John Abbott College's Professional Theatre and Music program, Gloria is thrilled to be a working technician in Montreal. Gloria is extremely honoured to be working with Persephone Productions on Mary's Wedding this spring. Previous responsibilities include stage manager and sound board operator for Canis Tempus' Sala XVIII, assistant stage manager for Several Scenes Involving a Decomposing Corpse, stage manager for Fiddler on the Roof and forCloud 9, props crew chief for 5th of July, and costume crew chief for Kiss Me, Kate. Gloria would like to take this opportunity to thank her family, friends and fellow colleagues for all their love and support throughout her journey! Congratulations to the cast and crew. Gordon is a Montreal-based composer for film and theatre whose music has been featured in performances across Canada and France. His involvement in the Montreal music scene began in 1993 as a DJ for Radio-McGill CKUT 90.3 FM. In 1998 while living in Toronto, he co-founded Technot, a presenter of live experimental electronic music featuring performances by over 100 international and Canadian artists. Shifting his focus to composing music for theatre, Gordon accompanied multimedia artist Renée Gagnon to the 2009 Festival d'Avignon for her presentation of Project McQueen and composed the music for Persephone’s 2010 production Henry V. His diversity of musical styles includes contemporary classical, rock, hip hop, techno, ambient, jazz, salsa, East Asian and Middle Eastern music. Clips of his work can be heard at: www.musiquesanguine.com. Ariel recently completed her 3rd year of studies at Concordia University in the Design for the Theatre specialization within the Theatre Program. She was very happy to kick off 2011 building props and running with the crew of Sala XVIII at Theatre St Catherine followed by the realization of her set design for Endless Forms Most Beautiful at Concordia. She is looking ahead to the summer and spending some relaxing time with her husband at their tree house on Manitoulin Island, catching rays and hopefully some fish too! She would like to thank Gabrielle and Persephone for this wonderful opportunity to work in the company of new friends. Lorne is currently studying theatre design at Concordia University. He began designing for the theatre in 2007 for The Sears Ontario Drama Festival and most recently designed the set for I Like Cowboys in the Fringe 2010 here in Montreal, which was nominated for the Théâtre Denise-Pelletier - Le prix Fred-Barryfor Production Design. Lorne is thrilled to have this opportunity to work with Persephone on their production of Mary's Wedding. 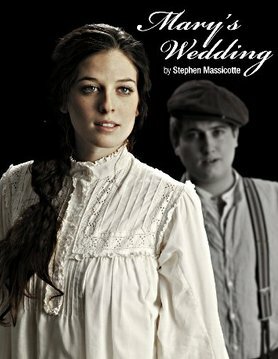 Stephen's play Mary's Wedding premiered in 2002 at Alberta Theatre Projects' annual playRites Festival and was the winner of the 2000 Alberta Playwriting Competition, the 2002 Betty Mitchell Award for Best New Play and the 2003 Alberta Book Award for Drama. Mary's Wedding continues to be produced in English and French throughout Canada, the UK and the US. His play The Oxford Roof Climber's Rebellion was commissioned by the National Arts Center of Canada and was produced in Toronto and Ottawa as a co-production between the Tarragon Theatre and Great Canadian Theatre Company and was a hit off Broadway. The play won the 2007 Canadian Author's Association Award for Best English Language Play and the 2007 Alberta Book Award for Drama. His newest play The Clockmaker premiered in February of 2009 at Alberta Theatre Projects' playRites Festival and was the winner of the 2009 Betty Mitchell Award for Best New Play. The Clockmaker had its US premiere at the City Theatre of Pittsburgh. Stephen's film writing credits include the feature films Ginger Snaps Back: The Beginning and The Dark.